It's our 100th post! And what better way to celebrate than with a Stella Special Deal! Take $10 off your purchase of $25 or more from our February Stella Spotlight store, The Cosmetic Market. 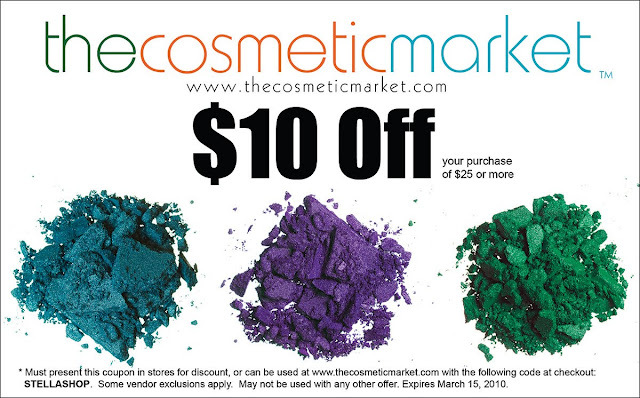 Print the coupon below and take it to any Cosmetic Market store or use the online code STELLASHOP for online purchases. If you live in the continental US, The Cosmetic Market will ship to you, so if you don't live in Nashville, this deal's for you too! Warehouse Row - Chattanooga, Tenn.